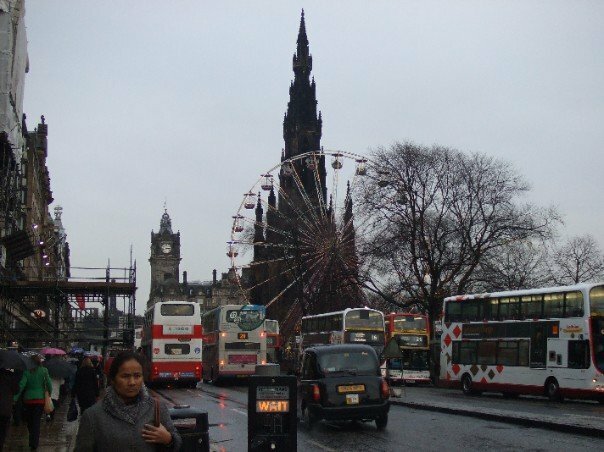 If you are moving or traveling to Edinburgh, Scotland a car is not necessary. Edinburgh is a small city that has a great bus network. To get out of the city, there are many train options. The main way to get around Edinburgh is by bus. Buses are usually double-layered, taking on the UK tradition. They go to every part of the city, through the suburbs and surrounding city region, having the most extensive bus service in Scotland. The biggest bus company is the Lothian bus, which always wins all sorts of awards. It operates most of the bus services within Edinburgh and the suburbs during the day. It offers rides from the airport, express routes, park and ride services, and nighttime buses. It is 91% owned by the City of Ediburgh, the rest being owned by suburban governments. Daytime rides are £1.20 for adults, nighttime rides are £3.00. Children between 5 and 15 pay 70p. You can pay cash into the bus hopper. Buses can ride in priority lanes, called Greenways, named for their green tarmac. During the hours of 7:30 AM to 9:30 AM, and 4 to 6:30 PM, buses, taxis and bicycles are allowed to ride on these lanes. To get around Scotland, there is the Scottish Citylink, which goes from Edinburgh to Stirling, Perth and Glasgow. There is also Megabus, which has discount rides to Glasgow and London. The main bus station is located at St Andrew Square. Edinburgh has a small suburban train network, part of the Edinburgh Crossrail. It goes from east to west along with city, through Edinburgh Park to Haymarket, Waverly, in the west (city center), to Brunstane and Newcraighall in the east. To get around Scotland and the greater United Kingdom, there is the Edinburgh Waverley, with a station in the city center, close to Princes Street Garden. It goes between London and Aberdeen, and all throughout Scotland. The major Edinburgh to London route is through the National Express East Coast. Cycling is not very popular in Edinburgh, as only about 2% of the city engage in it. However, there are about 75 km off-road bike routes in the Edinburgh area. They are allowed to go on the Greenways. Edinburgh is a relatively small city, so walking is possible. The pedestrian traffic is mostly in the condensed, downtown area around Princes Street, George Street and Rose Street. The lothian buses change the bus fare every year in the month of April. The Adult fare for single journey was raised the GBP 1.30 and day pass to GBP 3.20 in Aopril 2011.